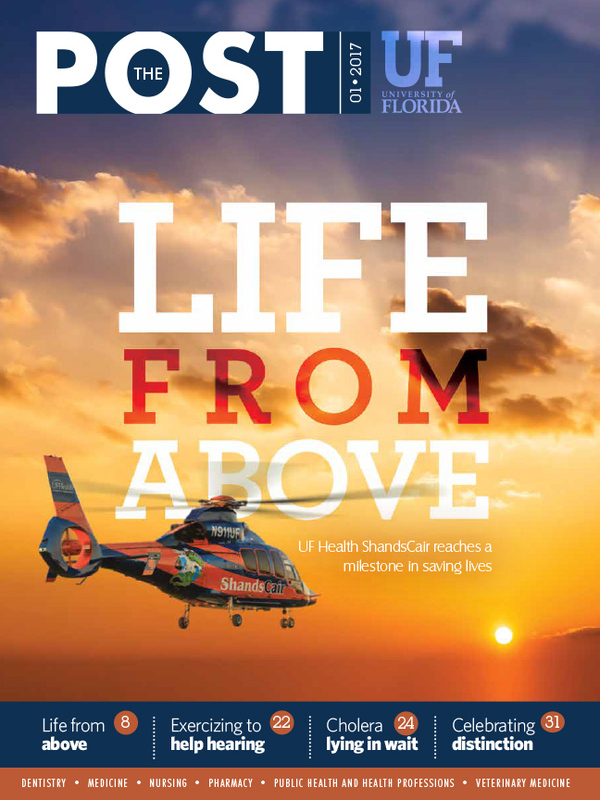 Every day, UF Health ShandsCair paints the sky orange and blue as highly skilled crews on the ground and in the air work together to get sick and seriously injured patients from life-threatening situations to safety. Now celebrating its 35th year of service, ShandsCair has saved more than 72,000 lives and continues to provide ground and flight transportation to those in need here and abroad. Founded by Richard Melker, M.D., Ph. D., the ShandsCair program began operating out of Gainesville with a fixed-wing aircraft that specialized in transporting premature infants. Not long after, the team recognized the need for more air medical and ground vehicles to serve patients of all ages. The flight crew now consists of the adult/pediatric team and the neonatal/pediatric team, which caters to the tiniest of patients. In 2014, ShandsCair added a state-of-the-art Airbus EC-155 helicopter, known as the biggest, fastest and most advanced civilian aeromedical helicopter in the Southeast. The ShandsCair fleet now includes one fixed-wing aircraft, three helicopters, six ambulances and two medical discharge vans. ShandsCair has also expanded its number of bases, with one in Perry, Florida and another in Summerfield, Florida. Today, the ShandsCair team is operated by David Meurer, M.D., medical director for adult and pediatrics; Michael Weiss, M.D., medical director for neonatal; and Staccie Allen, M.S.N., ARNP, E.M.T.-P, CFRN, program director. The ShandsCair family consists of more than 130 employees who are specially trained to care for the most critically ill patients. While much has changed in the last 35 years, the courage and dedication captured in the iconic image of Chopper Doc, created by Melker’s son Jeremy and which adorns most ShandsCair vehicles, remains a constant. Over the following pages, you’ll meet some of the dedicated people behind the scenes of this extraordinary lifesaving operation.